This module is community maintained and the Lightbend subscription doesn’t cover support for this module. It is also marked as may change. That means that the API, configuration or semantics can change without warning or deprecation period. 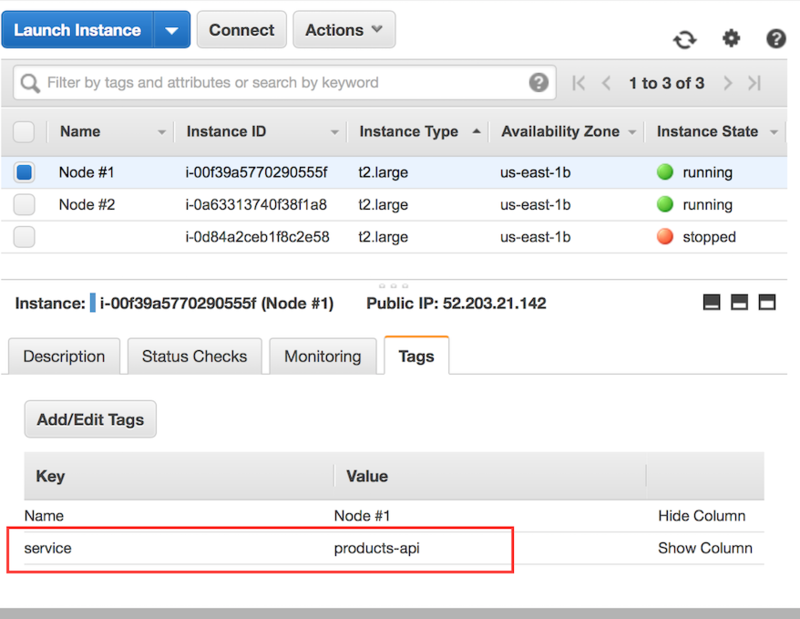 If you’re using EC2 directly or you’re using ECS with host mode networking and you’re deploying one container per cluster member, continue to Discovery Method: AWS API - EC2 Tag-Based Discovery. If you’re using ECS with awsvpcs mode networking (whether on EC2 or with Fargate), continue to Discovery Method: AWS API - ECS Discovery. ECS with bridge mode networking is not supported. If you’re using EKS, then you may want to use the ‘Kubernetes API’-based discovery method instead. You can use tags to simply mark the instances that belong to the same cluster. Use a tag that has “service” as the key and set the value equal to the name of your service (same value as akka.management.cluster.bootstrap.contact-point-discovery.service-name defined in application.conf, if you’re using this module for bootstrapping your Akka cluster). Note the tag service -> products-api. It is set on both instances. Note that this implementation is adequate for users running service clusters on vanilla EC2 instances. These instances can be created and tagged manually, or created via an auto-scaling group (ASG). If they are created via an ASG, they can be tagged automatically on creation. Simply add the tag to the auto-scaling group configuration and ensure the “Tag New Instances” option is checked. libraryDependencies += "com.lightbend.akka.discovery" %% "akka-discovery-aws-api" % "1.0.0"
You will need to make sure that the proper privileges are in place for the discovery implementation to access the Amazon EC2 API. The simplest way to do this is by creating a IAM role that, at a minimum, allows the DescribeInstances action. Attach this IAM role to the EC2 instances that need to access the discovery implementation. See the docs for IAM Roles for Amazon EC2. In general, for the EC2 instances to “talk to each other” (necessary for forming a cluster), they need to be in the same security group and the proper rules have to be set. By default, this module is configured for clusters with one Akka node per EC2 instance: it separates cluster members solely by their EC2 IP address. However, we can change the default configuration to indicate multiple ports per discovered EC2 IP, and achieve a setup with multiple Akka nodes (i.e. multiple JVMs) per EC2 instance. Note: this comes with the limitation that each EC2 instance has to have the same number of Akka nodes. You can change the default tag key from “service” to something else. This can be done via application.conf, by setting akka.discovery.aws-api-ec2-tag-based.tag-key to something else. If your service is running in a docker container, you will need to configure Akka Management with separate IPs for binding and discovery. This is because Akka Management needs to bind to the internal docker IP, but will discover the “host” IP (the EC2 private IP) on the AWS API. See Basic Configuration on how to separate the bind IP from the discovery IP. A working demo app is available in the integration-test folder. If you’re using ECS with awsvpc mode networking, you can have all task instances of a given ECS service discover each other. If you’re using this module for bootstrapping your Akka cluster that you’ll do so by setting the value of akka.management.cluster.bootstrap.contact-point-discovery.service-name to that of the ECS service itself. There are two “flavours” of the ECS Discovery module. Functionally they are identical; the difference is in which version of the AWS SDK they use. They are both provided so that you can choose which set of AWS SDK dependencies you’re most comfortable with bringing in to your project. This uses the mainstream AWS SDK. The advantage here is that if you’ve already got the mainstream AWS SDK as a dependency you’re not now also bringing in the preview SDK. The disadvantage is that the mainstream SDK does blocking IO. This uses the preview AWS SDK. The advantage here is that the SDK does non-blocking IO, which you probably want. You might need to think carefully before using this though if you’ve already got the mainstream AWS SDK as a dependency. Once the async AWS SDK is out of preview it is likely that the akka-discovery-aws-api module will be discontinued in favour of akka-discovery-aws-api-async. libraryDependencies += "com.lightbend.akka.discovery" %% "akka-discovery-aws-api-async" % "1.0.0"
Since the implementation uses the AWS ECS API, you’ll need to make sure that AWS credentials are provided. 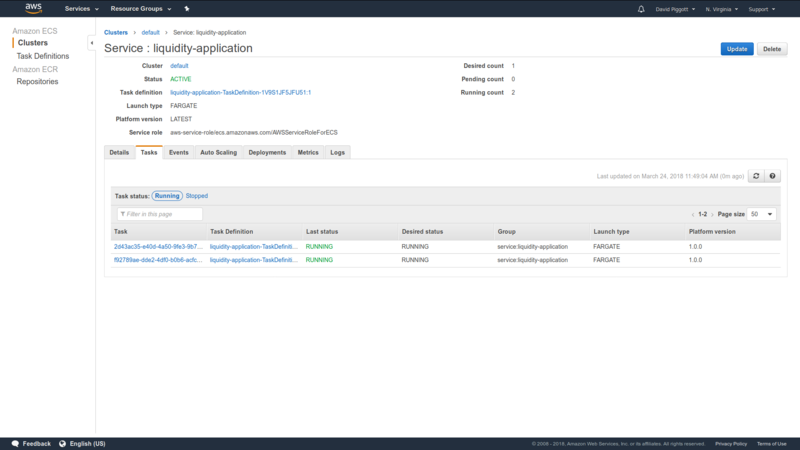 The simplest way to do this is to create an IAM role that includes appropriate permissions for AWS ECS API access. Attach this IAM role to the task definition of the ECS Service. See the docs for IAM Roles for Tasks. In general, for the ECS task instances to “talk to each other” (necessary for forming a cluster), they need to be in the same security group and the proper rules have to be set. See the docs for Task Networking with the awsvpc Network Mode. akka-remote by default sets akka.remote.netty.tcp.hostname to the result of InetAddress.getLocalHost.getHostAddress, and akka-management does the same for akka.management.http.hostname. However, InetAddress.getLocalHost.getHostAddress throws an exception when running in awsvpc mode (because the container name cannot be resolved), so you will need to set this explicitly. An alternative host address discovery method is provided by both modules. The methods are EcsSimpleServiceDiscovery.getContainerAddress and AsyncEcsSimpleServiceDiscovery.getContainerAddress respectively, which you should use to programmatically set both config hostnames. Because ECS service discovery is only able to discover IP addresses (not ports too) you’ll need to set akka.management.cluster.bootstrap.contact-point.fallback-port = 8558, where 8558 is whatever port you choose to bind akka-management to. The current implementation only supports discovery of service task instances within the same region. A working demo app is available in the integration-test folder. It includes CloudFormation templates with minimal permissions w.r.t to IAM policies and security group ingress, and so is a good starting point for any deployment that integrates the principle of least privilege.